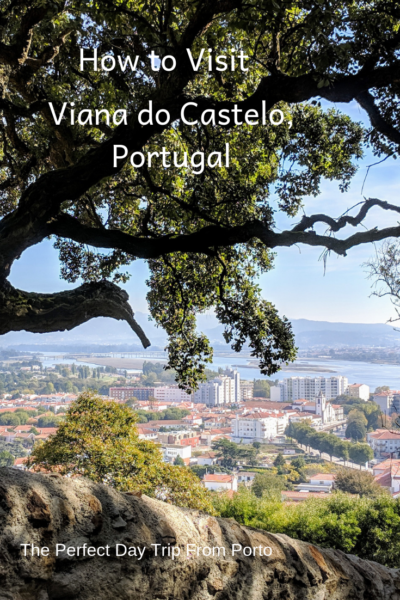 There are a multitude of reasons why one should visit the coastal city of Viana do Castelo. The views from atop Mt. Santa Luzia are breathtakingly beautiful. The historic city center is charming and a visit to Igreja de la Misericordia is well-worth the price of a train ticket. But, when you get right down to it, the reason everyone should visit Viana do Castelo is to eat doughnuts. Yes, you heard me. The city is famous for the Bola de Berlim. There are no adequate words to describe the deep fried cinnamon sugar coated puffs of dough, filled with custard, that deliciously melt in your mouth. Oh. My. Stars. They are to die for, especially when served warm. Heaven. I’m drooling just thinking about them. Bola de Berlims. Are you drooling?! 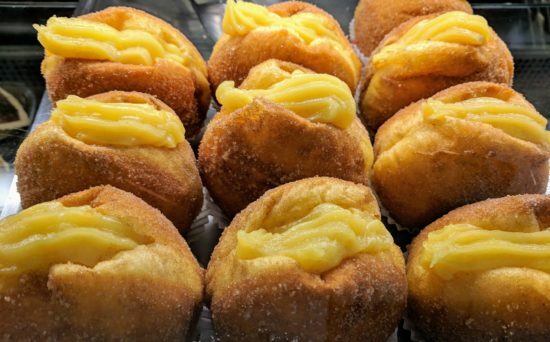 While Porto and Lisbon boast the wonders of the flaky custard cups known as natas, northern Portugal offers the berlims. Now, I’ve ordered berlims all over Portugal. I first discovered them in Lagos which was the first stop of our 2017 European adventure. And, I believed them to be yummy, especially when filled with Nutella. Because, really, doesn’t everything kissed with Nutella taste just a little bit better? But, when we told our Porto friends we were taking a day trip to Viana do Castelo, they all told us quite emphatically that we had to eat the berlims. Who were we to argue? I won’t even tell you how many we ate, but suffice it to say if I’m embarrassed to tell you, well then you can figure it out. Okay, so now that I have your attention let’s talk about our day trip from Porto. We caught the 8:13 a.m. train and the trip, which passed through lovely rural areas, took one hour. Our return train was at 3:08 p.m. and it took one hour and twenty minutes. It depends on the time of day, so a bit of preplanning can pay off if you’re on a tight schedule. Welcome to Viana do Castelo. 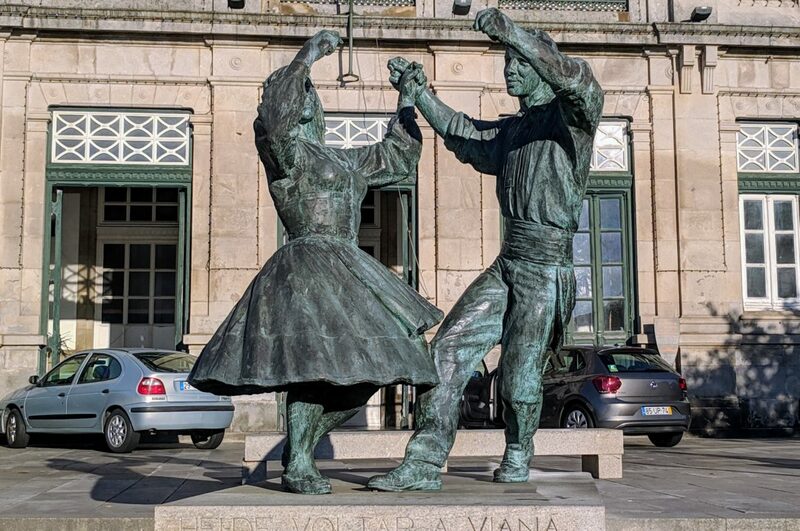 I love this sculpture, it’s so indicative of the Portuguese culture. Viana do Castelo is a port city and since we visited near the end of October, the morning was chilly and we were thankful for our sweaters. By the middle of the day though the sweaters were tied around our waists. Our first stop was, of course, breakfast. And what better than coffee, tea and multiple doughnuts. Once we achieved the proper sugar high we set off. Visiting Mt. 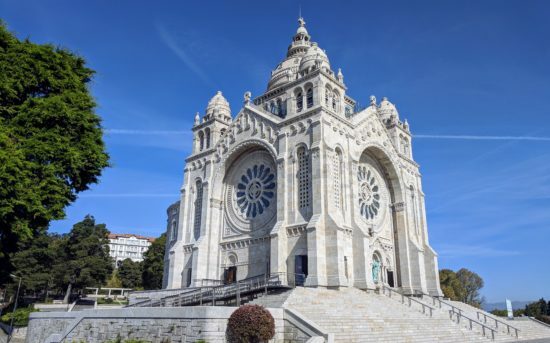 Santa Luzia was high on our must see list so we set off to scale the mountain – via funicular – to visit the Basilica and to take in the outstanding views. The funicular station is just a block from the train station and if one is up to it, there are 600+ stairs that can be climbed to reach the mount. The basilica was under construction from 1904 – 1959. The stained glass is incredible. We took the funicular because they are fun, but also because I said no way to climbing that many stairs. But, I did acquiesce to taking each step at a time on our way back down. The views along the way made it all worth while. And, speaking of views, take a look at this little video we shot and yes, that’s the Atlantic Ocean. Once we came down from taking in the views from Mt. Santa Luzia we really didn’t have any plans so we decided to just start wandering which is usually what we do best. When we wander we usually happen upon the best discoveries. And, this time was no exception. As we made our way to the city center we came upon the Igreja de la Misericordia. With no idea of what to expect, we each paid one euro and stepped inside. It can be said they we have visited a lot of churches, chapels, cathedrals and basilicas in our travels, but this little chapel dating back to the 16th century left us both speechless. I am mildly obsessed with pipe organs and these two seemingly suspended organs were beyond beautiful. Our visit will be long-remembered. After leaving the chapel we resumed our wandering ways. We explored much of the city center and made our way to the waterfront. Without a lot of time remaining in our day we opted not to walk the length of the waterfront, although it was very tempting as the day was beautiful. Instead, we chose a waterside restaurant and an outside table where we sat back and enjoyed a late afternoon lunch with a view. The food was good, the drinks were refreshing and the sunlight shimmering a path of light on the water was mesmerizing. We spent maybe an hour just taking it all in. What more could we have asked for? 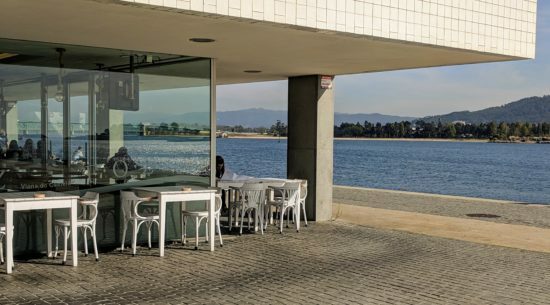 FOZ Caffe – on the waterfront. A relaxing spot to enjoy lunch with a view. Oh, and by the way, it should come as no surprise that we got back on the train to Porto with a box of doughnuts. Yep. We did. Now that’s a good lunch view, don’t you think? 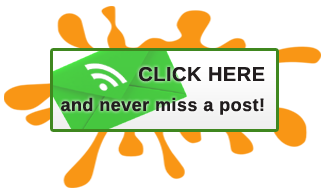 Search Viana do Castelo accommodations here. We’ve seen a lot of smaller motorhomes all around Portugal. I wouldn’t advise driving in to the heart of Porto in a motorhome, although the huge tourist buses do it all the time, but I don’t know how. They maneuver with inches of parked cars. But, we do see motorhomes parked just outside the city core. I guess you’ll have to start following some RV’ers groups on FB to find the best spots. You’re going to have a great time! I had to Pinterest this post on Viana do Castelo as it looks like my kind of place. There’s a lot to love about Portugal and one of my favorite things is that each village, town, city or hamlet all seem to have have something that sets them totally apart and makes each unique. The Basilica and Igreja look spectacular and OMG, what’s not to love about a country that makes both natas and berlins? Looks like you need to up your 10,000 steps a day goal if you keep finding culinary temptations like these! All of the little cities we’ve visited have something unique to offer, we loved them all. I have to say though that Braga and Viana are in the lead among our favorites. We often say the next time we’re in Porto for a length of time we’re going to revisit Braga and stay a few days. And, yes, 10,000 steps a day just barely cuts it when Berlims are in the picture! 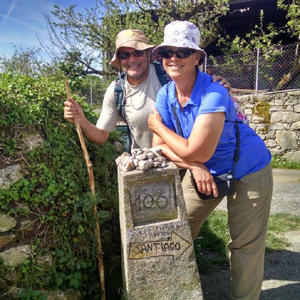 Thank you for transporting us through your photos and text to charming Viano de Castelo in northern Portugal. The berlins looked so, so appetizing and, yes, I did almost begin to drool! We were in your overseas home base of Porto in December and I would go back in a heartbeat simply for their divine napolitanas as I was a sucker for the pastry that oozed chocolate. I’ve been trying to swim off the extra weight since we returned! Keep on writing about Portugal as we didn’t have much time to discover its delights. That way we can live vicariously through you both. Anything that oozes chocolate is good with me, Annie. I’m so glad you enjoyed Porto. 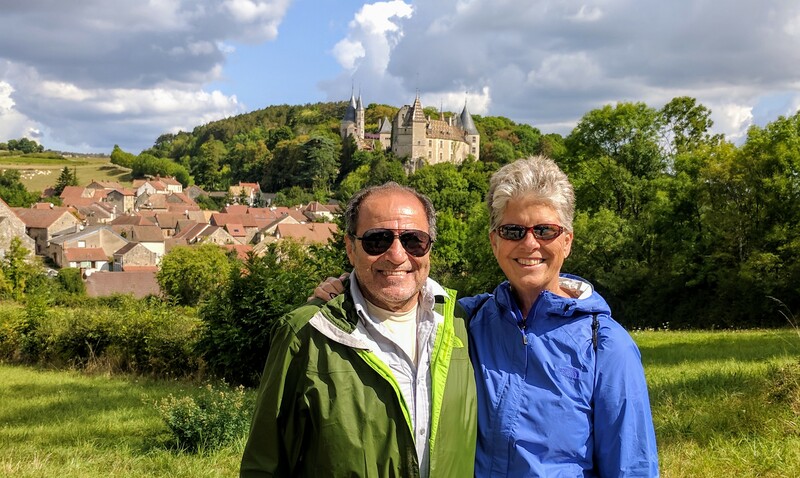 Porto is proving to be such a great base for us because as you can see, we can get to just about anywhere by train, which is our favorite mode of transportation when we travel. Stay tuned, there are more stories to come. I’m afraid that when we were in Lisbon, we loved that city so much out, that we failed to even take a trip to Porto or further and on reading this post, it kind of makes me wish we did. Except for the berlims haha… I had to drag Ben away from eating more Pasteis de Nata every single day we were there. Yes yes they were heavenly but that was the problem… so to add doughnuts filled with cream, would put us over the top. Because, yes we too would have bought a box! They are truly addicting, Peta, both the natas and the berlims. In Porto there is only 1 place where we get the natas – Fabrica de Nata – we get them warm out of the oven. To die for. The berlims are everywhere, but hands down none of them anywhere compare to what we had in Viana. You really need to return to Portugal one day and explore all of the smaller cities, each one has so much to offer. It worked, you got me at donuts, custard filled please. And just perfect at the beginning, and end, of a delightful day sauntering. You understand the love of the doughnut, Gaelyn.